Most writers understand the importance of having an author website to act as an online business card and an information hub. 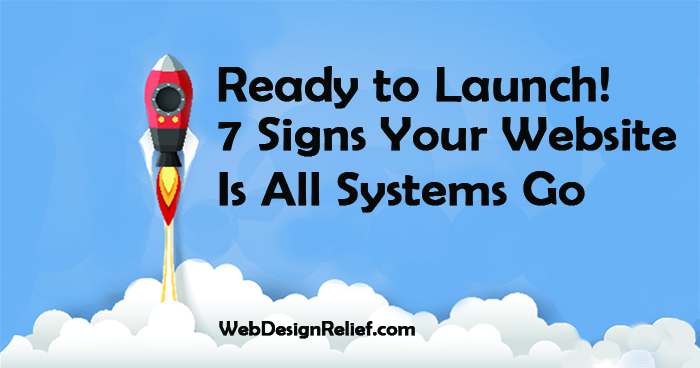 But at Web Design Relief, our experts know that before you press the button that launches your website, it’s important to make sure everything is all systems go! You don’t want to make your author website live, only to discover functional or navigational issues and typos that will make your visitors cringe—and bounce. Have you proofread your site? Yes, proofreading is as vital to website-building as it is to poetry, prose, or books. Typos will make your website look amateurish. This is especially true if you’re an author! Make sure your Oxford commas are in order and your proper nouns are properly capitalized before launching. Learn how to become a master proofer here. Do you have something to attract visitors? Your author website should showcase your writing and broaden your readership. Make certain that you have pages featuring excerpts of your book, blog posts, or links to your literary publications. You may also want to have a dedicated page where visitors can purchase your books, or you can include “Buy Now” buttons to third-party sellers to increase book sales. Is social media integrated into your website? While it is unlikely that visitors would spend several hours a day on your author website, the opposite is true for social networking apps like Facebook, Twitter, and Instagram. Have social media buttons prominently featured on your author website that link to your various social media platforms so visitors can follow you. Pro Tip: Verify that your social media pages are ready for the public. This means that your social media accounts aren’t set to private and aren’t flooded with personal posts that don’t pertain to your writing. In fact, don’t link to your personal social media—create separate accounts for your author persona, including a Facebook author page! Is your website safe? To protect yourself and your visitors, limit the personal information you share, especially your email address. This can attract unwanted spam from automated bots and leave your site vulnerable to hacking. Make sure you have effective Internet security in place by installing security plugins and captchas. Did you optimize your website for mobile use? Almost all websites are built via desktop computers, and while it might look perfect on the big screen, your website may not translate well to mobile use. As more people view websites on their mobile devices, it’s important for your website to look good on smartphones and tablets. Be sure to check that your author website is legible and functional on mobile devices before you make your site live. Does everything work? Perhaps the most important step before launching your website is to check that everything works! And we mean everything. Does your domain lead to your actual website? Are your hyperlinks live? Does your website work on multiple browsers? Do all of your buttons take visitors to the right location? Be your own guinea pig! Test your entire website prior to launch. Once you’ve confirmed all systems are go, you can rest assured that your readers will enjoy visiting your author website and learning more about you and your writing. Ready to help your writing career take off? 3…2…1…launch! Question: Which item on the checklist do you think is most important? Have you Googled your author name lately? What shows up in your search engine results? If the first page doesn’t include your website or other sites mentioning your books, you may want to reconsider whether your efforts to build an author brand are working. At Web Design Relief, we know that your being “Googleable” makes it easier for readers, editors, and literary agents to find you. Every writer needs an author website. Without it, you’re losing a valuable opportunity to create a hub for all your marketing and promotion activities. You’re also missing the chance to optimize that author website to boost your “Googleability.” Your website should be the first Google result that pops up when someone types in your name to find you. Optimization can be both technical and content based. Techie back-end improvements include the effective use of header tags, metadata keywords, alt-tags on photos, and smart use of hyperlinking. Front-end, content-based improvements that you can do yourself include frequent updating with new content, providing easy connections to social media, and taking advantage of multimedia tools such as photos, videos, and slideshows. Authors who quickly release a lot of books tend to have a strong presence in search engine results. It just makes sense that the more bylines you have, the more Googleable you become. If there’s a big gap of time between releases of your books, you may want to consider doing some short-form publications to keep your name visible. These could include publications in magazines or newspapers or writing short stories or novellas for an indie-published anthology, etc. Social media is so important to Google results that several publishing houses have included a clause in their contracts compelling authors to engage with followers on one or more platforms. Active engagement provides search engines with lots of mentions to feed algorithms. The bigger social media platforms are preferred by Google because of their massive reach. Consider engaging with your readers wherever they hang out most: Facebook, Twitter, Instagram, Pinterest, Tumblr, YouTube, etc. YouTube is owned by Google, so if you’re comfortable with “vlogging,” YouTube will give your search engine results a big boost. You already have a Google account if you have signed up for Gmail, Google Drive, Google+, etc., but how long has it been since you checked your Google profile? Make sure to include a tagline and an introduction about your work in the personal information section. Integrate relevant keywords to help improve your Google results and rankings. If you use Gmail, create an email address that includes your author name, rather than “bookwriter234” or something equally unspecific. Finalists and winners of writing contests are often publicized by the contest coordinators, adding another listing of your name to search engine algorithms. If you’re a self-published indie writer in control of your own book distribution, consider “going wide” rather than being exclusive to a certain vendor. When your work is available on Amazon, Apple Books, Kobo, Google Play, Barnes & Noble, Ingram, OverDrive, Scribd, Tolino, Playster, Bibliotheca, and Baker & Taylor, your Googleability will rise. If you want to build a brand and get your writing in front of readers, editors, and agents—being Googleable is mandatory. 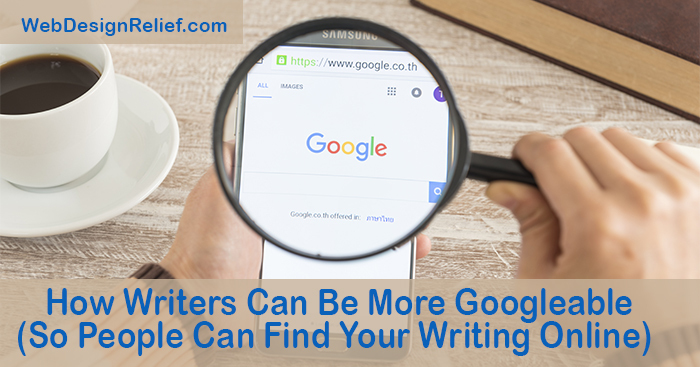 Discoverability depends on increasing your visibility in search engine rankings, and the results can make all the difference in your writing career. We just typed your name in the search bar. What will we find? Question: What methods do you use to increase your visibility in search engine results? At Web Design Relief, we know that choosing the right URL or domain for your new author website is just as important as designing and developing the actual website. Your Uniform Resource Locator (URL) is the web address that people will use to find your website on the Internet—it will represent you to your fans, visitors, and even literary editors and agents. Keep it short and sweet. Long URLs are tedious to type and difficult to remember. Which would you rather remember (and type out on your cell phone): JoeyDavidAuthor.com, or JoeyDavidWriterOfTwinPeaksFandomAndOtherTopics.com? Don’t include numbers or special characters. In today’s world of cybercrime and Internet spam, you don’t want your author website to look suspicious. Having numbers or symbols like hyphens or hashtags in your URL will look questionable to visitors: Is this really your author website, or a ploy to steal their information? Stick to using letters. Remember: You want people to click on your website, not shy away from it! Use your name (if possible). You want people to know they are in the right place, so it’s a good idea to make your name the focal point of your domain! If your first and last name as a domain is already taken, try a variation of your name and keywords related to writing. For example, YourLastNameWrites.com is easy to remember and clearly states who you are and what your objective is for your website. It’s also a good idea to use a keyword if you have a name that’s difficult to spell. Keywords are the words your audience will use when searching for you as a writer and your website. Because keywords are tracked by search engines, they can increase your website’s traffic. There are hundreds of ways to combine keywords and your name for a writer website, so put that creativity to work! Decide on the best website extension. 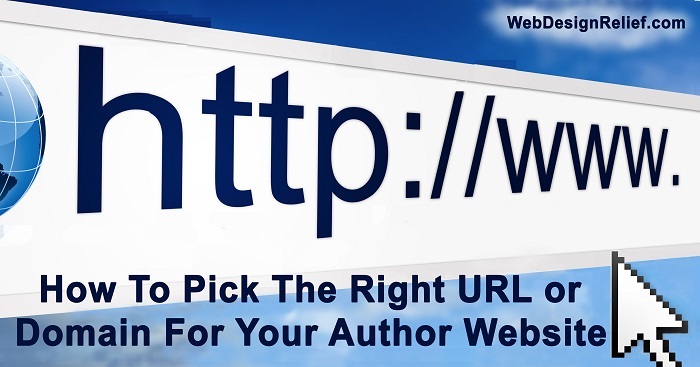 When coming up with your author website URL, you should also think about which website extension you want to use. An educational website would prefer .edu over a .co extension, and most nonprofit organizations use .org. Typically, we recommend that writers use the familiar .com extension, but other options include .net and .ink extensions. Follow these tips and tricks and you’ll have an unforgettable, practical author website domain. And the time to act is now, before someone else nabs your URL. If you’d like more help with building your author website and purchasing the best domain, talk to the experts at Web Design Relief today! QUESTION: What’s the most interesting, unforgettable URL you’ve seen?